The astronauts were so startled when they encountered the mysterious radio transmission they were unsure whether or not they should report it to NASA. Since the astronauts were in lunar orbit on the ‘far side’ of the moon, the radio transmission couldn’t have come from Earth, since during orbit at the ‘far side’ of the moon, spacecraft are out of radio contact with Earth for about an hour, meaning that the radio frequency must have originated from the far side of the moon. The recordings which were declassified in 2008 will air on the Science Channel’s NASA’s Unexplained Files this month. In the recording, we notice the astronauts reacting with surprise and confusion when the mysterious sounds overtook their headsets. At one point into the trip, NASA astronauts are heard debating whether or not they should contact NASA and reports the occurred. ‘You hear that? “You hear that? That whistling sound? Wooooo?” one of them says. 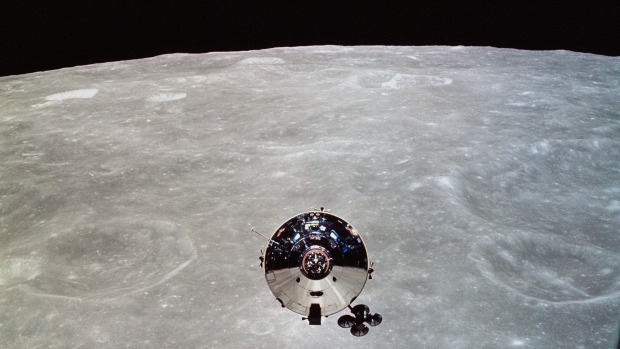 According to reports, the mysterious ‘otherworldly’ sound lasted nearly for an entire hour, during the time the capsule was at the far side of the moon. Back on Earth, the recording was kept away safely from the public, that is until 2008 when it became publicly available. The recordings have now resurfaced thanks to Science channel’s series NASA unexplained files, raising numerous questions about the Apollo missions and the truth behind the recordings, the moon landing and whether or not, the anomalous sounds have something to do with NASA avoiding the moon for decades. “You don’t hear about anything like that until years after the incident occurs, and then you kind of wonder, because it’s such an old memory of those things that you get concerned about if they were making something up or was there something really there? Because you never really know,” Worden told The Huffington Post in an interview. NASA’s unexplained files which analyze the mysterious recordings trying to come up with solutions in order to explain from where the sounds might have originated, including a magnetic field or atmosphere which could have interfered with the radio from the capsule orbiting the moo. However, according to experts, the moon does not have a magnetic field and not enough atmosphere to create such sounds. This is why, many people have started speculating that the mysterious signals intercepted by accident during the Apollo mission could have come from ‘Aliens’. The enigmatic Apollo 10 DSEA voice transcript (in PDF format) can be found by clicking here.